Phil Aleo, has researched over the years. These free books are available for all to read as eBooks. Simply click on any book to read. To make the statement that we can beat cancer is a powerful statement. any and all that have a listening ear. Life is so precious. I sincerely hope this information is beneficial to you and to others. The Chateau Louise Resort / Hotel, although gone now for decades, still holds a place in the heart of tens of thousands that once enjoyed her arts, music, food and entertainment. Although the published book titled Chateau Louise, 1961 to 1984 is out of print, it can still be enjoyed here on the author's website. Chicago, The First 100 Years, 1833-1933 is filled with written history as well as photos of Chicago predating the Chicago fire of 1871 and also photos directly afterwards. This is an educational and fun book for all to enjoy. Reincarnation is a belief that dates back thousands of years. It is taught throughout the earth and is the belief of millions. Reincarnation, The Evidence - highlights numerous accredited and fully documented examples of research that has been done over recent decades. Phil Aleo provided a number of walking tours for the public in 2015. 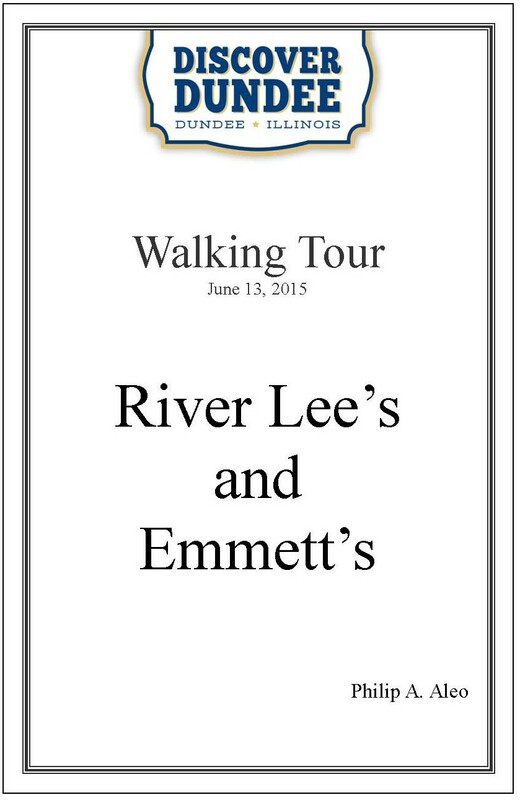 This walking tour included River Lee's Tavern in East Dundee and Emmett's Tavern and Brewing Company in West Dundee. The history behind the locations of both establishments dates back to the 1800's. This walking tour was part of the Discover Dundee campaign in 2015. This walking tour highlighted the original 22 room mansion that David H. Haeger purchased in Dundee in the year 1871. That same year, he also purchased the Dundee Brick Company. This tour includes both locations. The final tour in the series, this included two of the oldest churches in Dundee, the Immanuel Evangelical Lutheran Church and the First United Methodist Church. Both have histories going back to the roots of Dundee in the 1830's.